The Ballard Alliance, formerly Ballard Chamber of Commerce, works to ensure Seattle’s Ballard neighborhood remains a unique and economically vital community for its visitors, residents, businesses, and property owners. As a community partner, they continuously encourage improvements within our neighborhood and business districts. One improvement program, created to tackle the litter issue affecting our neighborhood, is a litter abatement program which recently kicked-off near the breweries. 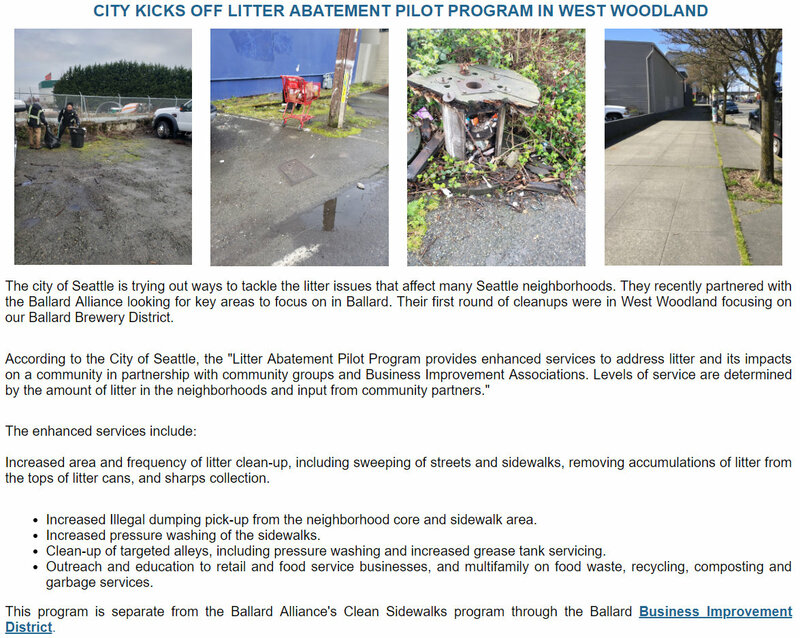 Thank you to the Ballard Alliance and Ballard Brewery partners for supporting this litter abatement program. The program will make our streets and sidewalks safe for those who live, work, and play in Ballard’s Brewery District. Membership in the Ballard Alliance provides an opportunity to promote your business or organization, keep informed about important events and issues, participate in B2B networking events and engage on broader community issues and initiatives. This looks like a good program. We hope the City is using the the litter tax, (a fee imposed on all carry-out and delivered meals from restaurants) to cover the cost of it. I would love to do something similar on NW 65th Street too!